Please note that, as every email client can be configured on various security levels, there is no bullet-proof solution to track ALL your email open rates. In most cases, the email tracking stats provided by Google Analytics should be good enough to have a very clear idea of your email open rates, but don’t take these numbers as absolute values. Basically, these email tracking reports will tell you how many people viewed the content of your email, including its images. 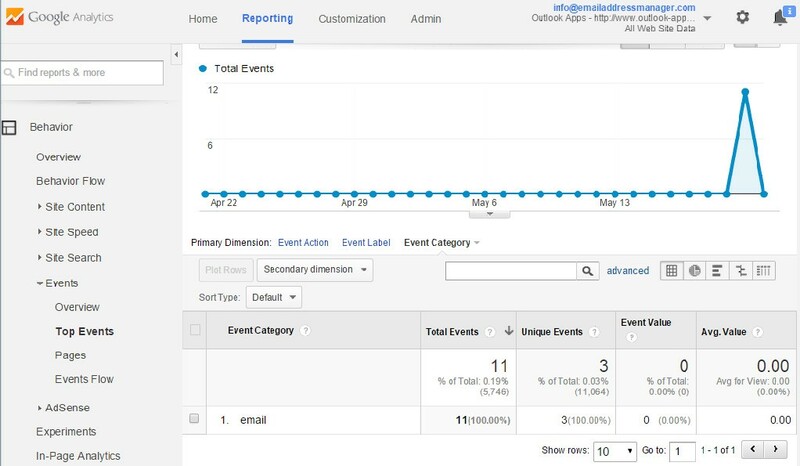 If your email recipients viewed your email without allowing the email client to display images, then these recipients are not tracked in your Google Analytics reports. – a Google Analytics account (signup here if you don’t have an account). Why tracking emails with Google Analytics? Well, any email tracking solution relies on inserting some code in your outgoing emails. Google domains represent a trusted web authority, so linking your email to a Google service is unlikely to trigger spam filters. Also, the Google Analytics email tracking method is not aggressive (it doesn’t allow you to collect real-life data), so your emails are also not intrusive towards your recipients. First of all, you need to have a web account (a web site – it doesn’t have to be same domain as the one of your email address) defined for your Google Analytics user account. Then you need to create a Property for it. When you add a web site account, a property is automatically generated for it, so you don’t need to manually create a property unless you want to manage your email tracking reports separately from your web site stats. On the “Property Settings” page, you need to copy the “Tracking ID” (for example, UA-38261237-1). 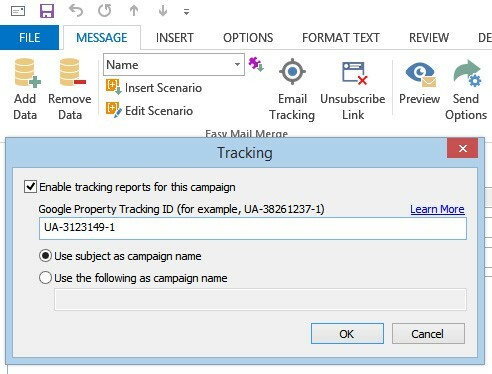 The email tracking feature via Google Analytics is available in Easy Mail Merge for Outlook starting with version 4. Get the latest version from here. Once you click on the OK button, Easy Mail Merge will automatically insert the email tracking code and it will enable Google Analytics to track your email open rates. 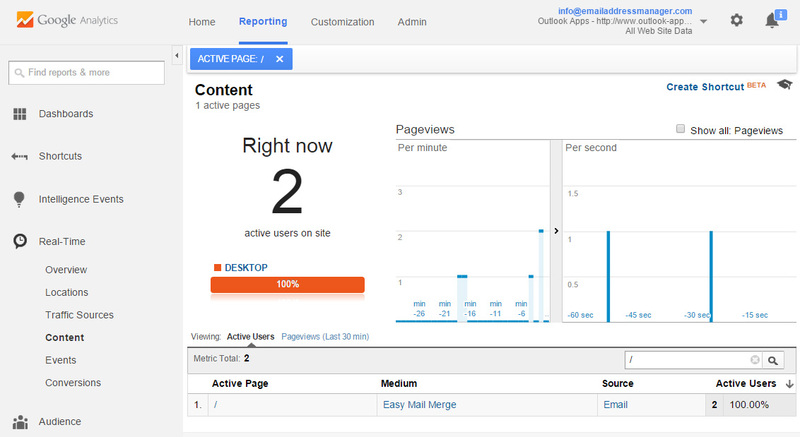 Your reports will be available in your Google Analytics account. Now all you have to do is to send your mail merge campaign, as you do with any other Easy Mail Merge session. Your email open rates will be available both as real time stats and as activity reports, in your Google Analytics account. 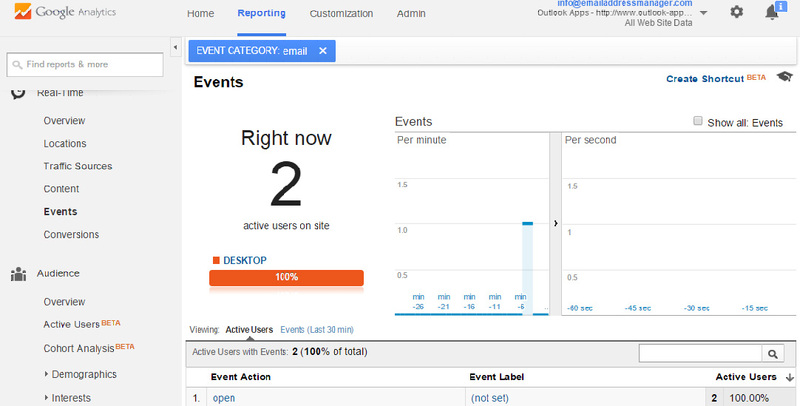 To view real time email open rates, login to your Google Analytics account, select the related web property, then click on the “Real-Time” tab, then select “Events”. These reports show the email open events as they happen, so it only makes sense to monitor these real-time reports only soon after you sent your emails. To view email tracking statistics for previous dates / periods, login to your Google Analytics account, select the related web property, then click on Behaviour -> Events -> Overview. If you have multiple events defined for your property, you can select the “Email” event in order to view only your email open statistics. By default, this email tracking report will show you how many people opened your email each day during the last 30 days. Please note that Google Analytics needs one day to aggregate your stats, so your email tracking stats will not be available for the current day (except for the real-time stats, of course). If you run multiple email campaigns, you can check the email open stats per each campaign in Google Analytics, by going to Acquisition -> Campaigns -> All Campaigns. Each of your email campaigns is displayed with its email subject text (or with the custom campaign name that you may specify in Easy Mail Merge). On top of the above tracking solution that lets you track how many times your email has been opened, you can also use the same software combo (Google Analytics, Microsoft Outlook, Easy Mail Merge) to track clicks from the emails you sent from Outlook. To enable email click tracking for Outlook / Google Analytics reports, you need to use the Google URL Builder in order to add Google Analytics parameters to your email links. These URL parameters will tell Google Analytics the source of your page visits, enabling it to record whoever visited your web page(s) by following links in your email. Then you have to copy the generated URL and paste it to your Easy Mail Merge session email, like you normally do with any other Outlook email links. 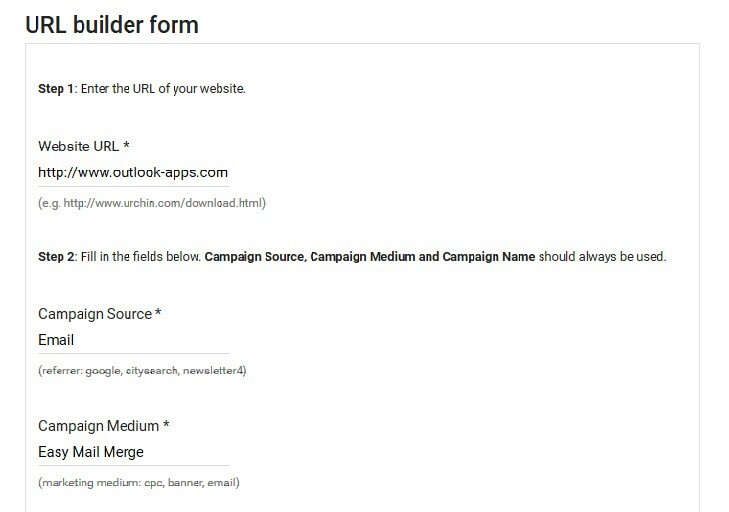 If you run multiple mail merge campaigns, you can use different campaign names in the Google URL Builder for each mail merge session, then you can compare the results of each campaign and decide which email content was the most effective in attracting users to your site.